The Volga Germans experienced periodic droughts and famines from the time of settlement in 1767 up to the Bolshevik Revolution. Prior to 1921, the most recent famine had occurred in 1892. The Russian Povolzhye (Volga region) famine of 1921 began early that year and its terrible impact was felt in Norka through 1924. It is estimated that this famine claimed the lives of 5 million people. The famine stemmed from both natural and human causes. A poor crop in 1920 which was made worse by the disruption of agricultural production, which started during World War I and continued through the disturbances of the Russian Revolution of 1917 and Civil War. The Bolshevik policies of War Communism (keeping the Red Army stocked with weapons and with food) and prodrazvyorstka (a campaign to confiscate grain and agricultural products) had set the stage for a large scale human tragedy. The American Relief Administration (ARA), which Herbert Hoover had formed to assist those who were starving as a result of World War I and the Russian Civil War, offered assistance to Vladimir Lenin in 1919. Lenin refused this offer as interference in Russian internal affairs. George Repp, a native of Norka and a founder of the Volga Relief Society in Portland, Oregon, became a prominent member of the ARA that saved thousands of Volga German families from starvation in the early 1920's. Repp unselfishly left his family and business in Portland to directly lead the relief efforts in the Volga German colonies and his hometown of Norka. "The first thing we saw was from fifteen hundred to two thousand people on the banks of the Volga, without food and in rags, mostly Germans, and all bound for somewhere, none of them knowing really where they wanted to go, but just to get away. Everything they possessed in this world they had with them; a good many were sick from exposure and hunger. They went about the city of Saratov picking up potato peelings, melon rinds, cabbage leaves, and in fact, anything that could be eaten. As fast as they could get transportation, either north or south, east or west, by rail or boat, they left." Repp arrived in the Volga River port colony of Schilling in early November 1921. He immediately began to organize food kitchens to help the most needy. About 200 children of the poorest families were fed first on November 6th. One little boy who was impatient to eat asked Repp, "Uncle, when will the kitchens open?" When he was told that the cooks were a little slow, the boy suggested an immediate remedy, "Let's throw them in the Volga." Repp arrived in nearby Norka on November 7th and found a dire situation. Rev. Wacker reported that there were over 2,000 children in the colony, of which 75 percent were starving. The committee of 13 men organized by Repp had to make the agonizing decisions about which children to feed first. The committee often visited the families to determine those in greatest need. The three kitchens in Norka were opened on November 14th, but only 500 people could be fed on the first day. The committee decided to use the school houses as feeding stations and the teachers backhäuser (bakehouses) were used for cooking. The committee had to collect utensils, water and hire cooks to do the work. The cooks were not paid with money, but received a double ration of food. The response was overwhelming. Rev. Wacker reported that the applicants responded "With tears of joy for those who were chosen, and tears of sorrow for those who had been dropped." Food supplies were brought in on wagons from Schilling. Initially, enough food was brought to last for six weeks. On the morning of November 14, the smoke from the kitchen chimneys rose to the wintry heavens. Every child who possessed an admittance card armed himself with a plate and spoon. Although the food was not served until noon, the kitchens reminded one of a besieged fortress by ten o'clock... Finally, the doors opened, and in wild confusion, but finally every child found a place... A board which had been placed over two school benches acted as the serving table. Upon it lay pieces of bread which blinded one with their whiteness. None of us had seen such bread for years, and to the poorer children it was something entirely new. From here I went into the kitchen where two cooks were stirring the rice porridge, which was being cooked in ten or twelve large kettles. This was Monday and according to the American (ARA) program, cocoa should have been prepared, but because of the bad roads from Schilling, it had not arrived yet. Consequently, the children are given rice porridge on two successive days. In the meantime, the member of the committee were showing the children to their places. Everything seems to be taking too long in the little fellows' opinion, and as some waited for their names to be read, the others, who already had a place moved impatiently on their benches in expectation of the things that were to come. Several of them examined their plates once more on the outside and inside, as if they wanted to convince themselves that none of the precious porridge would be lost. I do not know if it was mere shyness or if she suddenly could not understand the meaning of it all. She had already heard that strange men would come and take away the people's bread, but now strange men had come and brought bread. In a letter to John W. Miller dated February 13, 1922, Repp reports that they are feeding 35,000 souls on the Bergseite and by February 24th, they will be feeding 40,000. Repp also reports that there will soon be enough food to begin feeding adults. In addition to feeding the most needy, seed grain was provided in hopes of creating a successful harvest in 1922. Clothing was also provided to the extent possible. Records from the Volga Relief Society show that many families in the United States sent both money and clothing to Norka for those in need. Child feeding station in Alt Dönhof, not far from Norka. Throughout 1922 and 1923 the famine was still widespread and the ARA continued to provide relief supplies. Meanwhile, grain was being exported by the Soviet government to raise funds for the revival of industry. These actions seriously endangered Western support for the relief effort, and made clear the long-standing Soviet policy of valuing development above the lives of the rural population. Rev. Wacker reported a moderate harvest in 1922 and a poor harvest in 1923, made worse by an "in-kind" tax on the grain, which left the people with little to live on. Wacker's letters to friends in the United States continued support for the relief effort. Many people, including Conrad Brill, decided to leave the desperate situation in Norka and emigrate through Germany to the United States. These would be some of the last Volga Germans to flee Russia. "Blessings and peace be with you and an affectionate kiss and greetings of love from us, Heinrich and Christina Burbach, to you dear cousin Elisabeth and your husband and children. You ask how it goes with us--here things are going very poorly. Time has taken everything from us. You know how it once was and now we are so poor. We have 2 fields that we work, we have no cow, only 2 sheep. You cannot imagine our poverty. We have no seed to sow and also nothing to live on. Our children ask; "What is there still to eat?" We cannot rely on you dear brothers and sisters because you have your father to deal with. But if it is not too difficult, could you help us a little?" Many heart-breaking letters were written between family, friends, and the Volga German clergy living in Russia and North America during the famine. These letters were often published in Die Welt-Post (The World Post), a German language newspaper originally established in Lincoln, Nebraska. Some letters, like those received by the Sinner family, were kept privately. While the situation remained fragile, conditions slowly improved in the late 1920s when one of Norka's native sons, Heinrich Wacker, came from Amerika to visit his homeland. Wacker wanted to see first hand what had happened to family and friends living in Norka and would report back to those living in the United States and Canada with stories and a rare film. The population of Norka declined from over 14,000 in 1912 to under 7,000 by 1923. 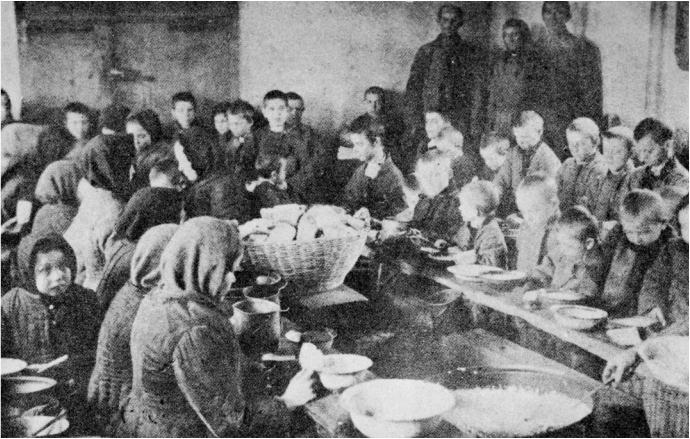 While some of the decrease was certainly due to emigration, the impact of wars and the Bolshevik Revolution, there is no doubt that the famine had taken a great toll on the colony of Norka. Peter Sinner states that one-third of the Volga German population died from 1921 to 1924. There was relative improvement in life for the people of Norka for a brief period in the late 1920's and early 1930's. 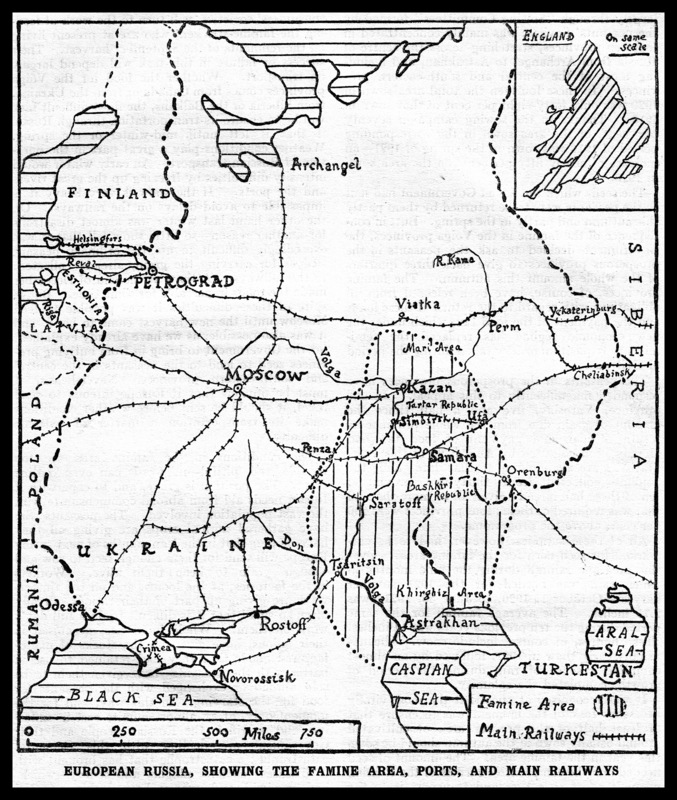 By 1932, a politically motivated famine would soon ravage the Volga region and Ukraine and by the mid-1930's Stalin's Great Terror would descend like a dark cloud over all of Russia. Remember Those Who Starve! - 1921 Russian Poster by Ivan Simakov (1877-1925). Source: Wikipedia (public domain). Sinner, Samuel. 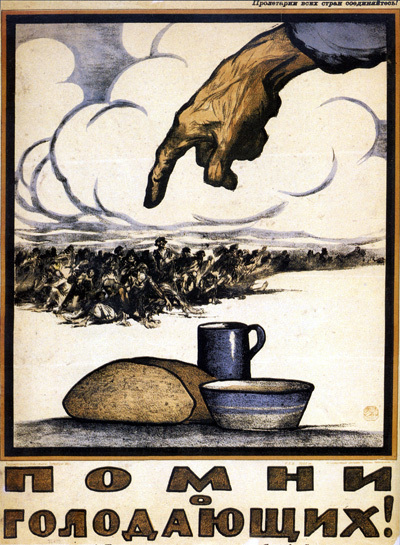 "Famine in the Volga Basin, 1920-1924, and the American Volga Relief Society Records." Nebraska History 78 (1997): 134-38. Print. Walters, George J. Wir Wollen Deutsche Bleiben (We Want to Remain German): The Story of the Volga Germans. Kansas City, MO: Halcyon House, 1982. 187-208. Print. Volga Relief Society list of donations from the United States to people in Norka 1922-23. Last updated July 8, 2018.